We are an independent Estate Agency committed to providing an exceptional level of service. Tempertons offer a wealth of local knowledge and experience with well appointed staff headed in each office by a Chartered Surveyor, having a successful track record and a lifetime of living in the local area. Established in Telford in 1966 we continued to enjoy growing success and opened a second branch in Newport in 1978, moving to Telford Town Centre soon afterwards. 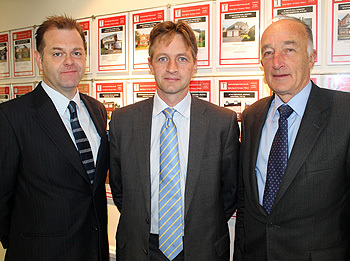 Our Partners, Nicholas Hughes MRICS, and Andrew Temperton MRICS, together with Andrew's uncle, Ron Temperton MRICS have between them almost 100 years of experience within the property industry. Since expanding our Newport office, we have now concentrated our teams into two locations, to provide specialist local knowledge centres within Telford and Newport. We are a family firm, exceptionally enthusiastic and passionate, with a highly motivated team having a personal interest in achieving the best results for our clients whilst remaining focused on ensuring the highest service standards and maintaining regular contact at all times. This, together with expert negotiating skills, sound local knowledge and superb marketing, enable us to offer a service of which we are proud. As well as having our own easy to use internet website we also subscribe to many key national property portals such as Rightmove, OnTheMarket and Guild of Professional Estate Agents to ensure we fully maximise the coverage of your home. We also provide high profile local newspaper advertising and quality brochures, many with floor plans and stylish photographs, to suit your requirements. We look forward to welcoming you into our offices where you will be assured of a warm welcome from all our staff.